1. Remind your runners that you’ll have their tags and they don’t have to come to the registration table. (This will make it much easier for the UA (unattached runners) to p/u their tags. Coaches and Assistant coaches pick up tags. 2. Please return the unused pins and tags to me before you leave. I recycle the tags. 3. Please have the your runners pin their tags on the front of their shirt through the end of the tag (not the hole). They are marked “pin here”. This makes it easier for the “pullers” in the chute to tear and string the tags. 4. Remind your runners(especially the young ones) not to play with/tear off their tags before the race. We had quite a few frantic kids & parents rushing the registration table for new tags as they had already torn theirs off. 6. Coaches will be emailed course maps or you can look on this site. 8. Parents must stay in designated areas and do not run with kids. 9. Keep dogs of course!! 11. Teach your kids the slow to fast concept at the beginning of the races. 12. 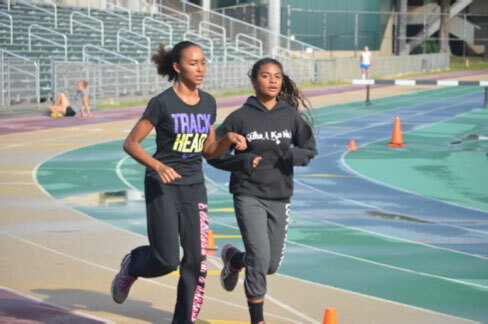 Host schools need to do results and submit to coaches, Maui News, and me. Will put them online once received. 13. Kids can be disqualified from races if they cut course, push another runner down, impede a runner at the finish line, assisted by coaches and or parents and other runners by pushing them physically along the course. And swearing. 14. Please remind parents about sportsmanship at the meet and be respectful to all the volunteers. We’re ready for another Youth Cross Country season. Finish times and places will be will be sorted by gender. All entries should be sent to Athletic.net. Race tags will be generated for each race according these entries. Race day registration for individual runners is available prior to the race. NOTE: Please keep in mind that this will take time and therefore these runners should arrive no later than 45 minutes prior to race time. Individual entries will be done in order of arrival. Individual entries may be done at race site. Please use the same format as in the example in row one. All questions regarding entries should be sent to Rudy Huber at huber_rudy@yahoo.com.